Passengers traveling aboard Karmel Shuttle receive a Text message with our "Rate my Ride" App. Reviews below are from our actual passengers in Real time. Karmel Shuttle monitors driver's very closely with the use of the Rating App. 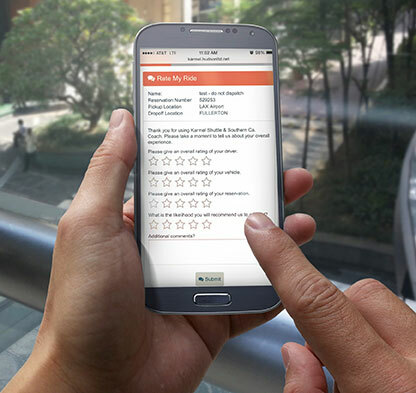 Our Customer Ratings average 4.5 out of 5 stars! Let's face it...this is LA! One of the worst places for traffic in the Country! One lane shut down on a freeway can easily cause a 20-30 minute delay. A freeway closure can cause complete havic on our drivers arriving anywhere on time! Did you know. LAX controls the flow of traffic for all transportation and shuttle companies within the terminals! Driver's have to go through a trip ticket booth to enter the terminals to pick-up passengers. and causing the flow around the airport to be extremely slow. We thank you for understanding all the challenges our driver's face in our industry. With today's technology we do the best we can to get our driver's to you on time! Monique is very pleasant and caring, as well as a good driver. What a pleasant, courteous, careful driver!Exceptional service! Thank you! This morning's driver was so friendly and personable. He made the drive both pleasant and safe, and I arrived at the airport with lots of time to check in leisurely. Thank you! The drivers on this trip 3/21 through 3/24, 2019 were on time, a good conversationalists and made this trip to La Congress memorable. I will definitely refer Karmel to my friends and use Karmel next year. Thank you. Our driver Katrina was a wonderful person and a great driver you are lucky to have her as an employee! Wow, LAX traffic is awful. Very good service. On time and clean shuttle. They picked us up less than 20 min after calling the airport. Great service! Our driver was very personable, professional and friendly. This was the second time we have used Karmel (the first time was on 3/1) and have had a very positive experience both times. We will continue to use your services. Thanks for finding me despite sharing wrong terminal. Definitely beat the $100 Uber ride and great driver. Was 20 minutes late and I think it'd be beneficial to have a bit of a plus minus. Ontime for my flight though! Will was an amazing driver & tour guide! His customer service was phenomenal. I felt welcomed & comfortable the entire ride. Thank you for the excellency all around. My sister said the ride was fast and driver excellent. Will definitely always use you and recommend to everyone. Not only was our driver fantastic, the ease of booking the shuttle, your communication, and locating it at the airport was fantastic! Highly recommend!! Very efficient service. Took the stress and uncertainty away. Driver excellent and went above and beyond. Super nice driver but not very smooth in the traffic. We werent in a hurry so we didnt care about being at the airport by a certain time. Our drive on Monday was amazing! Super different experience. yourr driver is the best we ever had! Our flight was delayed and Karmel kept on top of the changes to make sure we had a ride when we finally arrived at LAX. Dennis was absolutely wonderful! !Thank you for great service. Our driver this morning was excellent. He was punctual, very polite, had great relaxing morning tunes on at the perfect low volume. The vehicle was clean and the temperature inside the van was perfect. Our driver Jay was fantastic!! Terrence was friendly and helpful. We enjoyed our ride very much. Mike was a friendly driver, but his driving made us nervous. There were a few times that he swerved in and out of lanes and I was seriously worried for our safety. I hope that this was an isolated incident and that he is normally a cautious driver. Royal was a great, friendly driver. The service was on time and everything went smoothly. When customers contact the dispatcher about a concern an authentic apology is expected. Not harsh criticism, reprimand, or sarcasm. Nor is it polite or friendly to be dismissive and rude. Especially to a customer that prepaid the highest tip. Terrence was a great driver. I enjoyed talking with him, it made the ride go very quickly. Great member of your team! Awesome! Barely had to wait for the shuttle at the airport. Driver drove safe and got us here quickly. Mar was fabulous - great driver. Your texts and pickup time were great! Thanks so much! I will highly recommend your company!!! 2nd time. Same excellent service. On time and very courteous driver. Marcus did a fantastic job bringing us home. He was a real gentleman. Our female driver whose name I forget was also excellent taking us to LAX. I do not ever hesitate to use Karmel Shuttle. Terrence was a fantastic driver and was very personable. He made the ride enjoyable! Terrance was so wonderful I asked for his card for our return! Thank you! Every thing was handled with courtesy and professionalism. Pick up was on time both from home and from the airport. Richard was great, he has excellent customer service! We accidentally left our ipad in the shuttle (#361), and they were able to return it to the hotel at which we were staying later that night! I was so impressed and so grateful! Our driver Katrina was excellent. She was able to answer our questions about the surrounding area and was very friendly. Our reservation experience was seamless. The text confirmations were handy & made one less thing to worry about while travelling. Terrance was friendly knowledgeable and professional!! We loved the little gal that picked us up!!! Zach was a great driver!. Very personable, great music. Great driving. Thanks! There was some confusion about where to pick us up and the driver didn't know where it was. Luckily he had my phone number and called us to set a new location for pick up. This company made my travel so easy. Great, efficient service. Wonderful customer service all around. The dispatcher was very accommodating, as was the driver. Our driver was so friendly and I felt like we got a built in tour. Thanks so much.... such a nice welcome to our destination! Our driver was so awesome - even if it was early in the morning, he made us feel like our vacation truly started with a tour of the city on the way to Anaheim. I cant remember his name but he was driving vehicle #435. Driver was awesome and deserves a raise. Tremendous person! I loved my driver!! She was so happy and it made the trip to airport fun. I didnt get her name but I really enjoyed her company. Please thank her for me. I will use your service again in future. Can I request van 420 driver again.? I dont how to spell her last name. She was so helpful w me n my cane. Over 30 mins wait from the time we confirmed that we got our luggages. Carlos was our driver. He was very professional and I enjoyed talking with him on the drive to the airport. He does a great job! Cliff was excellent, on time and friendly. Your shuttle is the greatest!!! Love all your drivers! THANK YOU!!!!! Way better than a taxi. Terrence was great! I felt informed, welcomed, and taken care of. Thanks! Drove us to the airport. Didnt talk at all. Did not ask about climate in van Too hot or too cold. Assisted little w/unloading bags I helped in and out of the van. Basically a ride to airport by a stranger our other experience was a ride with a friend. Love this company! Will use again! We had to change our times over and over again because of our flight cancellations. Karmel services were so helpful and kind! Our driver was HILARIOUS and so fun! Thank you!!! Every time we use Karmel we are always pleased with every aspect of your company. The driver in 438 today was wonderful She got her van full of folks to LAX in a smooth n quick time. Hope I have her again. I always recommend your company several times a week on FB. Your drivers are so nice and the new van was lovely. I just wish you had the Anaheim Hotel listed on your website of going to hotel so I can reserve a ride online. Thank you for your service. Terrance is a great representative of your company and provided the perfect start to my business trip in Long beach! Thank you for the quick, kind and efficient ride. Monique was awesome. Friendly and we felt safe going to the airport! Give her a raise and a bonus! The driver was fantastic and your vehicles are so clean. Thank you. Driver was cautious + courteous.He kept a safe distance between vehicles + did not race to the airport. A very comfortable ride. Thank you. He was early to pick us up from hotel which was a bit stressful for my party. Terrence was a terrific driver! Russ was a great driver. It was pouring rain and was so very cautious! Highly recommend this service and will definitely be using Karmel again! Driver was kind courteous and knowledgeable. On time and drove very safely. We like your service. Driver Katrina was so kind and friendly.Very good driver!Would not hesitate to use again or recommend to people. Absolutely the cleanest van weve had!The driver was exceptionally nice. Overall happy. The process to get through to dispatch took longer than I expected. Zachery is awesome! Highly recommend! Have used your service before and it is always excellent. Thankyou for your service. Monica went above and beyond. She is a great driver and very friendly and caring. One of the best drivers I have ever had the pleasure of meeting. Terrance was waiting when I arrived at the boat terminal & was so friendly! Iâm always impressed with your service. My driver was friendly and efficient, and she arrived promptly (early, actually). This worked out great. Very friendly driver and very timely. I liked getting the text messages for confirmation and reminders. Worked out great and very timely. Reasonable cost. I was impressed to be dropped at my hotel lobby, without help from me. You have a good system and drivers. Driver Josh did an outstanding job in difficult traffic conditions. Terrence was EXCELLENT! Very polite and professional, and a very safe driver. THANK YOU FOR THE GREAT SERVICE! Felt safe and comfortable riding with Jeff. He gave me some helpful restaurant suggestions. Will definately use Karmel my next visit. We were extremely satisfied and very impressed with our entire experience. Driver was courteous and helpful.. he was on time and a safe driver. We will for sure use your company next time! Junior was very helpful and I had a great ride. Mike was perfectly on time, courteous and helpful! Thank you, you guys are the best! We loved our driver! She was on time and was very friendly to us! Ricardo was very nice, professional and helpful. A good man! Thank you! Brian was a great driver and conversationalist. I will use your service when I come to L.A. in the future. Thanks. The reservation line was so nice and accommodating, and the driver was awesome too! Thank you! Your fee for shuttle service is a little too high but the service has always been reliable. You took the hassle out of this trip to Disneyland. Tropicana recommended you and good for them . The experience was great. Thank you and kudos to both your drivers. Great welcoming attitudes both of them great guys. Driver was the best one that we have had. Would like him the next time we travel. Leg room was cramped, but enjoyed the promptness of the driver and great touristy tidbits about LA/Anaheim. So very convienient - I have used this service before & will continues to do so when available!! Private tour with Terrance as our driver was the best day! We had a great time. Excellent service and on time. Cannot be more pleased with your shuttle service. Your driver was very professional, courteous, with excellent driving skills n right on time....Im a believer n Karmel! The reservation process was easy and our pickupand driver experience were excellent. Charles, the driver in vehicle 434, was a very friendly and safe driver. Driver was 20 minutes late. Our second drive, also very kind. Impressed by her ability to maneuver in the rain and heavy traffic. Great driver very kind. Assisted me with 2 kids and lots of lugggage. Driver had zero people skills. Driving and service was otherwise okay. Appreciated the company's flexibility on our reservation changes. Juan was a great driver! Very friendly and helpful! Denise, our driver was absolutely awesome. It is worth another booking just to get her as a driver. If this is our welcome to LA drivers. Then wed book a round trip. She was fantastic (and hilarious)! It was nice to know the shuttle was still going to come even though it took 1 1/2 hours to get our luggage. Roy was a good driver and pleasant to talk to. Thank! Mike was a fantastic driver. Very smooth ride. I am very particular with driving habits and he was very savvy and professional. We had a very good conversation and the ride as a whole was extremely pleasant. Highly impressed! Your company does a great job, and Ive referred several friends and relatives!Thank you! Our driver was very polite, professional, and respectful. He made our transit experience smooth and relaxing and was an excellent driver. Very impressed! Fantastic driver found phone and passport I left and doubled back to give to me! The driver, Denise, was wonderful! The van was pretty shaky. Everything was great until I arrived and was waiting to receive my lagguage which is not in my control.You told me that drive is not going to wait for me and leaving in 5mim. A lot of stress and pressure! !The driver was very rood! Our drive er has been driving 32 years and still love s it. He was great!! Richard was fantastic and got us to our destination safely. Easy to make reservations and because we reserved with a credit card, we were dropped off with nothing to do but go inside our room. My driver was extremely courteous & professional. She was pleasant & I enjoyed the conversation on our drive to the airport. Yes, I would recommend karmel shuttle! The service was great and able to accommodate our large group with varying ages. Thanks so much. Our driver Charles was welcoming and engaging. On our ride to San Pedro he showed us the history of LA and the surrounding scenery. Great driver. Denise was an exceptional driver with a great friendly personality! Best driver we ever had. He should be given a medal. Terrence was the best driver weve ever had. Great guy and was so aweaome with our kids. Fantastic service! The driver was very kind and patient. Greg was great. Very kind and a good driver. Driver was very friendly and helpful, assisting with my bags when we arrived at airport. Good experience!! Thanks! Will use you again for our travel needs!!! John did fantastic job. Safe driving and on time. Thank you very much. Will use you again. I am very impressed with your company. Polite, friendly, prompt. Thank you! Highly recommend! We forgot to double-check our departure time with the airline and they still accommodated our change in time. Entirely our fault. They are amazing. Thank you. Will definitely use in the future. Denise our driver was fantastic!!!! The shuttle bus was on time, van was very clean, and Denise was very knowledgeable about the area. Thank you Karmel Shuttle for a great experience!!! Kevin my driver was great company on the ride home. We never stopped talking! Francisco was great! Van was nice. Have always used Express Shuttle but will defiantly use Karmel on my next trip to So. Cal. Driver was especially friendly and helpful. Bad squeak in the van. Driver was great and was even early for our pickup! Driver was so friendly and pleasant!! Pamela, the driver, was very accommodating. She knew how to maneuver getting into airport. I had great experience with Karmel. Will be next year when I come to Congress. The driver was very nice, on time and a very safe driver. A great person representing your company. Roy was awesome! Hes a real asset to your company. You should give him a big raise! Kevin was very nice and drove safely! We were impressed with the great text communication with us before, during and after. Our driver was friendly, solicitous about us and a safe, courteous driver. We have used Super Shuttle in the past but you are outstanding! You are on time! Driver was very pleasant, entertaining. Started our visit on a good note!! Driver was really great, he pointed out all the convenient places like CVS and Walgreens, and even pointed out where the main entrance was for the convention center where my conference was. Overall, very helpful! Our driver drove safely and showed great patience in the crazy traffic here. He new the routes. I enjoyed the trip. Our ride was safe and fast; our driver very pleasant. Your automated reservation system works beautifully. Friendly driver, would have him drive for me again. This was a great way to get from the airport to our hotel. The driver was personable, cautious and friendly. The shuttle arrived within 10 minutes of our call and we were on our way very quickly. Service with Karmel was excellent!! I wrote a long message and somehow lost it.We really appreciated the drivers and their help. Thank you..
Everything worked perfectly - short wait (10 mins) for pickup - very safe driver - great service, thanks! Fast, friendly and nice that you dont circle the airport before heading out. Driver was friendly and provided a lot of useful information. Kevin was very friendly and a nice driver. Also, I made changes to my reservation at one point, and the operator I dealt with was very friendly and helpful in changing the reservation. Clean van; nice driver; handled the traffic and poor weather very well! Thanks! The driver was very knowledgeable, but his driving was a bit off, my wife started to get car sick bs that never happens. I would say it was more due to the traffic and him trying to get us to our location and not have to sit in traffic for hours. Outstanding service both ways. Both Drivers were very safe and courteous. Did nit catch the second driver's name but would like to know for future reference. Loved your service! Would highly recommend and would definitely use again! Thanks for the great drivers and making our vacation relaxing and easy by leaving the driving to Karmel! Professional and extremely patient considering the time of day we had to travel. This was the best ride to the airport I have ever had. Thanks so much! Very good dispatch/reservation technology. Thank you. Great service from your drivers and dispatch as usual! Everyone was fantastic. From making the person making the reservation to the drivers. Thank you for making things great. Everything was perfect. Van wasnt crowded and was comfortable. Nice quick smooth ride to our hotel. Our driver was very nice and personable. Great transportation experience. I would appreciate having the same driver on my return trip if at all possible. Vehicle had some odd noises. Wasnt able to get a discount as indicated in conference materials. Both drivers were personable and very efficient - highly recommend ! Driver was friendly and did a great job getting us to our destination. He was great! The driver was great. He put my talking and was very helpful. Our driver Kevin was very professional & customer focused!!! Thank you!!! I had a great experience. My driver was so friendly and the entire process was so easy. Thanks so much! Fernando (Francisco??) LOVE HIM!!! Nice quiet music in the van. Really helped me get to flight on time. I would request him. Dan was great. Very professional and friendly. Monique was knowledgeable and friendly. Exceptional! The driver named Mar in van #401 was exceptional. She is the quality of person that you want to represent Karmel Shuttles. My experience was very pleasant. Safe ride. Court is professional and courteous. Felt very safe with driver. Knew she had to be certified in some way. Not a random driver off the street. Great job!! Josh was awesome!! Gaves is lots of useful information and tips. It was wonderful that he pointed out some landmarks too!! I really didnt enjoy his take on life and it was a long drive. However, he was a good driver. Traveling made easy! Great drivers, excellent service. Would definitely use Karmel again. The driver, Mike, was very courteous and professional. I really appreciated his coming out to pick me up so late at night. Thank you! Safe and courteous! Thank you. Great! Loved the text system. The driver was quiet. Maybe because we riders were visiting. Enjoyed the driver! He shared lots of info and answered questions. Masel was a wonderful drives. Very professional and friendly. Karmel drivers are always courteous and dependable. Ill never use another shuttle service!! The vehicle was a bit dirty. There was a Dorito on. The seat I was supposed to sit in. There was also a paper shoved into the air vent. The gentlemen were kind and the ride was smooth. We use Karmel every time we come to Ananheim- love the service and today our driver Josh was excellent, made the trip to the airport more enjoyable! Thanks! There is a loud rattle in the passenger door that should be fixed. My driver was great and personable. Everything went smoothly. Our driver was very friendly this morning! Great job by the driver and especially dispatch in keeping me informed. Our driver was much better on our return trip. The van was cleaner. Overall, a much more relaxed experience. My driver, Danny, was wonderful, so polite, helpful and made my traffic to LAX a breeze. I continue to depend on you and have yet too be disappointed though do hear people using other shuttles do! Thank you, Danny and Karmel?? Our driver Mike was great. He worked VERY hard to get us to our hotel as soon as possible which was a feat in 5:00 traffic. He was personable, friendly and funny. Thank you! Zachary did an excellent job. I'd ask for him again. Plz tell him thank you. I cant thank you enough for getting me to the airport on time by a very friendly driver. Nothing but good things to tell people about Karmel Shuttle service! Karmel Shuttle exceeds my expectations every time. From clean comfortable vans to prompt service and courteous drivers . Thank you! Our driver Mike on #410 was great! Terrence was a great host. Felt safe. Excellent service, really appreciate the text message updates on arrival. We are greatful for the service. It was appreciated after dismal baggage handling and understaffing by Air Canada. Perfect! Courteous and friendly driver (Earnest) who was great! Such a pleasure using your company...so efficient and my drivers have always been professional and lovely. I was a little nervous I wouldnt find my ride. But everything was perfect, from the text message updates to the sweetest driver. I will always use this service and recommend you to everyone! Cliff was a great driver and made the ride home a pleasure. With employees like Cliff and Francisco, I will most certainly do business with Karmel Shuttle. Driver didnt follow GPS and took an extra 15 mins to get to destination. Nice that driver was on time and friendly. Davis was best driver I have had yet! Great guy! Our driver was terrific! He got us to our destination safely. Bonus! He was friendly!!! Excellent! Highly recommend you! Great service! Carlos is the best! Very accommodating and positive. And professional. He gave me great information about Costa Rica. He was a joy to talk with and the ride to LAX went quickly. I will definitely use your services again and will recommend you to others. I was Jerry t happy at all w our driver on Jan 27th, she was on the phone all the way from LAX to our Hotel in Garden Grove and we were very nervous that we would get in an accident. But, Josh our Driver today,Feb 3rd, did an excellent job! Very good company with excellent vans and drivers! Makes it easy to get from our hotel to the airport. Loved our drivers - but especially the one from the airport to hotel! Interesting facts - sense of humor! Suggestions for places to eat and see?? Took 20 mins for van to arrive, never had to wait that long. Great service, what a stress free way to get to Disneyland. Thank you! Awesome driver! My son left his baseball hat in the van, he drove back and dropped off. Unbelievable service! One of the best drivers. Friendly and kind.Best transportation is with Karmel!!!! Thanks for making my experience memorable. Mike is super nice and courteous.Smooth and enjoyable ride, Ill recommend to friends and family.Thank you. This driver is so nice.I'll use Karmel again. Our driver was awesome and personable!! Excellent service!! Very good driver. Was so pleasant to talk to her. I find your online booking/confirm difficult to use. I always have to use the phone to make or complete booking. Really enjoyed the convenience of your shuttle and your awesome drivers! Alex was very helpful and accommodating!!! Driver made great time, very personable and not too chatty. The vehicle was clean but slightly musty smelling. Thank you. Driver was nice but honestly shouldn't be a professional driver. My husband and I felt very unsafe and sick the whole ride to the airport. He was constantly accelerating and swerving. His range of speed was between 55-80, speeding up and slowing down. Both drivers were excellent!! They were on time, kind, and respectful. I felt safe with them. Thank you very much.. I like how you texted us with the van number and where to wait. Our driver was very polite and friendly. We missed our scheduled flight and everybody who helped us was very professional and accommodating. A wonderful experience!! Driver of 399 was the best Karmel driver we've ever had! Very friendly and personable. When you arrive at the airport tired, he's exactly the kind of welcoming person you want! I wasn't too impressed with being packed in and being drove around for a while picking other passengers up. The return trip wasn't as good as the original pickup. Josh, our driver, was outstanding with additional information regarding the area. We would request him when we come back! On time, very good service. Will use their sevice again. We were told we could split billing with two cards but they wouldn't let us. Jerry was prompt, curtious, and very professional. Have had a really good experience with your service. Driver was awesome. Thank you. Our driver was very polite and knowledgeable of how to get us to our hotel the best and fastest way safely. Our driver was amazing!!! He was super friendly and was a safe driver!!!! Very pleasant and very quick. Carlos was the driver today. We was very nice, courteous and got us to the airport in plenty of time. Driver was very professional, friendly, and efficient. The vehicle was a little creaky and bumpy, but we got to the airport in good time. Great conversation. Early arrival. Thanks. Great service! Thanks so much for making the trip quick and easy! Driver was great. Mike on the 30th and (I think) Kevin on the 27th were professional and personable. We really enjoyed their help. We really like your service. You never disappoint. Our driver was on time and friendly! Very easy to book the reservation. We used Karmel in the past. Karmel has been our number one choice of transportation when we come to Disneyland. Our driver was SUPER today. Thank you. Perfect trip to airport, especially liked our driver. Very friendly. Thank you! Friendly and prompt. Would ride with again. Driver was incredibly nice, the whole process was seamless. The best way to get from LAX to Disneyland! Great service from dan! I had never done this before so I figured I'd have to wait. But he was right there waiting for me and the drive to my hotel was a breeze. He has a great personality and I enjoyed chatting with him. Would definitely recommend! Jose is a fantastic driver! I felt safe & secure the whole time! Driver Cineka (sp?) was on time, very professional, ans customer focused. Best drive I have had in a while. Very friendly driver. I was the 1st ride of the day, and he was at my house early. Very safe and professional driver. The trip to the airport flew by. It was like talking to a friend. I will definitely continue to recommend Karmel. Driver was very good and helpful. Driver was very knowledgeable of the area and provided excellent advice. Terrence was wonderful. We were very impressed. Great helpful driver. Service made transportation easy for this trip. Good service. Driver was nice. Socorro was great. We have used your compNy before and will use you again. Kevin was great. Picked me up on his second round, we then picked up 4 more people on the third round. Excellent service! I'll use it again in the future. Wish I was sent information on the hotel pickup in advance since it was set without my knowledge. Luckily it worked out and I was ready. Driver was early and very friendly. His van was very well organized and clean. He was a very safe driver and got me to the airport ahead of schedule. Drivers were very nice and accommodating. Shuttles were a bit worn, but clean and always on time. The reservation process was nice and smooth. The whole transaction from start to finish with your company was fantastic! Mike the driver was very nice as well! I am very delighted with your service. Thank you! The driver was very nice. He offered my child the use of a tablet with Netflix during the trip to the hotel. Excellent service. We'll definitely book your shuttle service again. Good price courteous drivers. Timely and helpful. I think a notification should be sent when the shuttle is on the way with an estimated time of arrival or a number of prior stops before one's schedule pick up and the shuttle number. Each person should not have to call and speak with a Dispatcher. The pick up was late. This is the first time using Karmel. I was impressed with the on-time service, automated notifications and directions given. I will use Karmel again. Little late but good service overall. We didn't leave the hotel for over 30 mins after our p/up time. 3 out of the 4 passengers were ready, but we had to wait around for 1 person who never showed up. I feel as though there should be a wait of 10 mins and not longer. It was a great service. I'll definitely use it again in the future. John was wonderful! So patient and kind. Such a safe driver! Your service was everything I needed. Without much-needed attention by me, everything was handled with ease by you and the driver was awesome at his job. Thank you so much. Very easy booking. The driver was on time, and the van was spotless. Very high class driver. I enjoyed my ride immensely. I didn't have to wait at all. Shuttle was on time. Excellent service overall. We are very impressed with the outstanding service. My driver was right on time and it was a verrrry pleasant ride to the airport! Thank you. Give the man a raise! Very clean car! The driver was very friendly. Great service Drivers should carry change to not affect the tip You guys are great! Outstanding driver. Pleasant, with a great personality. Timely pick up. Driver was friendly, shared helpful info, and was a safe driver. Definitely will use again in the future. Thank you. Ryan was our driver and he was superb. Friendly, helpful, courteous and a very good driver! Loved the driver giving us updates on how long it would take us to arrive at the hotel. Really appreciated as this is my first time here. 1st time user. Will use again. Omar did great job. Early on time for pickup. Fought thru traffic jam and made it to LAX on time. Carlos in van 399 was so incredibly nice and respectful. He really made the end of our trip! Would HIGHLY recommend Carlos!! Super friendly stuff and no charge for switching shuttle times! The pickup was quick, even after my flight was delayed. After calling the 1-888 number, a shuttle was there within 10 minutes. The driver/operator was the best part. Brian in 422. Professional and engaging, and service to the letter. Great experience! I am very happy with this service, excellent driver and very friendly. Reservation system, confirmation, pickup all outstanding. Will use again. Jerry was very professional and personable. He made our experience traveling to the airport enjoyable. The shuttle was timely and the driver was helpful and friendly. The phone staff and especially both drivers were very courteous, friendly and professional! I recommend raises for the drivers! It was a blessing traveling with you! We are very happy with our driver's excellent service. He was very pleasant. Will definitely recommend your shuttle service. My driver was a very friendly lady and she made the trip to the airport very enjoyable. Both drivers were very personable. Made the ride enjoyable. Our driver was awesome and friendly. We are repeat customers and recommend you. Driver and ride was great. Wait to be picked up was a little long...maybe 45 mins to an hour, but all in all okay. Driver early and very friendly and helpful!! You have won us over! Excellent service & right on time! See you in November of 2017. Driver in vehicle 399 was great got us they LAX traffic n on our way home. Anyway when I travel w Karmel again I could request him? Josh was great! Welcoming and knowledgable about the area! Such a friendly driver and fast easy service. Very pleased! Great first impression! Well organized & easy to navigate on my smart phone! Very nice driver. Sowell ( Is it right name) Anyway it was a wonderful ride. Everything went smoothly; texts all helpful. Our driver was very friendly and kept us calm in traffic! We have been so impressed with Karmel and their drivers. They are so kind and quick to help. We just got off of a boat that was 39 min late. We were tired, frustrated, a little sea sick, worried we had missed our ride but there was Karmel waiting for us. John was professional and personable. Expertly drive us to our destination. I would highly recommend Karmel Shuttle to family and friends. Our driver was great. We were late getting out of Disneyland we got a call about 5 minutes before our pick-up letting us know she was at hotel and she was very understanding and super friendly when we finally arrived. Driver very pleasant and helpful. Very short wait til pickup. My plane was late & your driver was extremely polite & waited. Top service, as always. Thank you again!!!! Driver very professional, friendly and knowledgable! Really enjoy the text Communications and continually keeping us informed! Driver very personable! We were so thankful we didn't have to drive in LA rush hour traffic on our virgin trip to the city. Will definitely use again in the future. Left my phone in the van when we were dropped off a LAX. Fortunately the driver answered and circled back around to save the day! The service was already quick and painless, this just made me a lifelong customer. Kudos! My driver was wonderful. She arrived early for pickup and was very personable. She kept me company and shared stories with me during our drive. She was also very knowledgeable about the area. Excellent driver. Helpful, and courteous. The shuttle service for both legs of our trip was fantastic! The drivers arrived incredibly prompt and super nice. I will absolutely recommend this company to my friends and family. Thank you so much!! We had an excellent driver! He was cordial, safe and made the shuttle experience a positive one! Our driver was punctual and very pleasant. We arrived at our destination quickly and safely. Great driver--pleasant. Shuttle on time. Your service is always exceptional. The driver was excellent! He drove very smoothly! I don't think he had to apply his brakes one time until we came to a red light. The van was nice and cool. My daughter asked him to turn off the radio because we were tired of traveling noise. Thank you for accommodating me after my flight was cancelled and I had to take a later flight! On time and helpful. Texting is great! Great service. Our driver was excellent. She was so friendly and provided us with a lot of information about Disneyland and restaurants. Excellent! On time pick up and got me here with plenty of time to spare! Great service! I did recommend to a friend and she used your service. Very nice driver. Prompt pick up. Safe and courteous driver. Our only choice for shuttle service! Everything was exactly on time and the messaging was stellar! Jerry was an great driver.